As many may have suspected, kites nested in the Bloom School neighborhood this summer. A juvenile bird, which cannot yet fly very well, is still being fed by the adults. Here are a couple of pictures. I took this photo on 8-24-08 at Bloom School about 8:15a.m. I know that DuPage County is about an hour or more away, but a rare bird was discovered there today that merits an announcement. A Curlew Sandpiper, mostly molted into basic plumage, but with some brick red patches on the upper breast, a downcurved bill, some barring still on the undertail coverts, and black legs, is at a fluddle at the Green Valley Forest Preserve. The preserve is located at the intersection of IL 53 and 83rd Street in Woodridge, IL. If you plan to go, here is a parking tip. Going S on IL 53, turn left on 83rd Street. Go up the hill past several apartment complex parking areas and turn left on to the first public street in the neighborhood. Park there and walk back down the hill (about 500 feet) and cross back over IL 53 (there is a pedestrian crosswalk push button on the pole) to the forest preserve. The fluddle is just ahead on the left. The bird was feeding in the water along the north edge of the fluddle (nearest to the gravel path). You will need to leave the gravel path a short distance into the grasses to get a spot where you can scope the fluddle without having grass in your way. Also there (and the reason I went in the first place) is a Red-necked Phalarope and a Wilson’s Phalarope which flew in while we were watching the other phalarope! On Friday, Aug 22, Eric Secker stopped by Bloom School to see the Mississippi Kites. He saw two adults as well as an immature. This is the first sighting of an immature bird that we have heard about. Kite-watchers should keep an eye out for the kitelet and see if there is more than one! It is interesting to try to see what prey the kites are catching. On Wednesday Marjory Rand and I saw one of the adult kites come in to the dead elm tree carrying prey and being chased by a Chimney Swift. The prey item turned out to be another Chimney Swift! It must have been tasty because later in the day I looked under the tree and found nothing but two primary feathers from the swift. 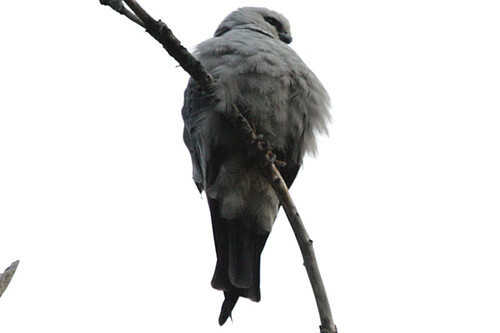 The 2 adult Mississippi Kites were still present at Bloom School at 1:30-2:00 p.m. this afternoon. Also flying over in the vicinity was an adult Broad-winged Hawk and a distant Red-tailed Hawk. Yesterday, an immature Broad-winged Hawk was haunting the nearby trees along Westchester Drive, and a kestrel flew through. The kites are still very vocal, particularly when another raptor, like a Cooper’s Hawk or a Broad-winged, fly too close. I met Mike Madsen, Andy Sigler, and Bob and Karen Fisher at Bloom School at noon today. Andy and Mike had just come from Cooling Sod Farm, where they reported up to 7 Buff-breasted Sandpipers and a couple of Upland Sandpipers among the hundreds of Killdeer. Best viewing of these birds today was along Cherry Valley Road at the entrance to the sod farm (gravel driveway by a pump house). Do not enter the driveway, it is private property. You can park near the road (there is plenty of room by the driveway entrance) and scope the fields. Some of the birds are quite far away. A scope is essential. By the way, 2 kites were coming and going around the perch at Bloom School, and an immature Broad-winged Hawk was in the neighborhood, which seemed to upset the kites. Whenever the hawk showed itself, the kites started calling. Interesting to hear them vocalize. Drove early in the morning to Bloom School and before I could park the car, I spotted the kite in “the perch tree”. Lighting stunk the whole time I was there but this is one of the shots I got. Note: School is starting very soon so teachers were showing up ~0700. There were also some people “walking” dogs (i.e. letting them run loose). Kite could care less. Anyone going here has a HIGH chance of seeing the bird (I only saw one this morning) and there is quite a bit of parking. As noted by Larry, this is a fun place to watch other raptors as well. While I didn’t see any Kestrels, a juv. Cooper’s Hawk was busy dive-bombing the abundant supply of squirrels. It seemed more of a game than an actual hunting attempt. The kites were easy to find this morning between 7:45 and 9:15 at Emma Lundgren Arboretum. Don’t know where that is? Don’t bother Googling it. It’s actually the small clump of trees between the Bloom School parking lot and Grenham Place. The perch most often used was in the dead tree with no bark at the base, just a few feet from the bike rack in the parking lot. There are a couple of kestrels to be found there, and every once in a while the kites and kestrels would chase each other. Just to add to the raptor fun, also to be found are two Cooper’s Hawks—an adult and a juvenile.